In 2016, the palliative care community lost a dedicated advocate and compassionate caregiver when Eloise “Ellie” Coyne died. 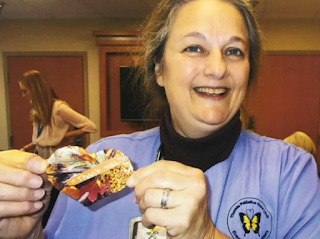 She was well-known to the Virginia Commonwealth University (VCU) Community where she held the position of Volunteer Coordinator but her colleagues knew the all different roles she played for patients and staff on the 11 bed unit: mother, advocate, healer, listener, comforter and mother. Of all the many things Ellie provided to her patients and colleagues, perhaps the most important was here complete acceptance of all people, with an uncanny ability to meet people exactly where they were and see value in each person. Ellie regularly provided opportunities to create legacy through story telling, artwork, photos and mementos. It was rare for a patient to leave the Thomas Palliative Care unit without a pillow case of signatures or a plaster caste with a handprint. One of the legacy projects that now lives on in her absence has been lovingly named “Ellie’s Box”. Quinn recalls a time when a family was struggling with the timing of removing their loved on from life-prolonging artificial support. After they had the opportunity to choose stones that reflected their loved one and had her finger prints placed on them, it was as if the memento they received had ensured their connection would not be lost. The family held tightly to the stones in their hands and allowed extubation and a peaceful death to proceed. At VCU, the stones are kept in boxes that families can look through and choose from, on the palliative care unit. 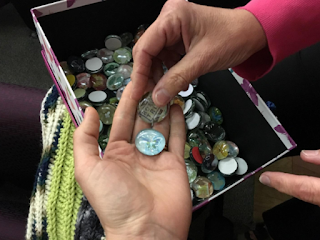 The idea has spread, however, throughout the hospital, to the point that the palliative team tubes the stones throughout the hospital to other units where patients are in their last hours or days. 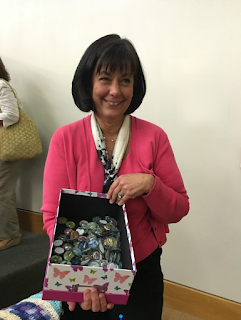 So now, families leave VCU with a memento and memory of their loved one, due in part to Ellie’s work and influence on the providers in that system. If it had been up to Ellie, all suffering patients and families would have a hand to hold, a comforting blanket and a memento to take home with them that can continue on. It is only fitting that Ellie’s Boxes be made and offered to people in other health systems as well. It is just the way Ellie would have wanted. Kristina Newport, MD, FAAHPM, is a palliative medicine physician in Central pennsylvania who will soon join the Palliative Care team at Penn State Health as Section Chief and Assistant Professor in the College of Medicine. You can find her on Twitter at @kbnewport. You can read her other Pallimed posts here.